High quality .999 solid silver struck in beautiful relief of the classic AA token design. 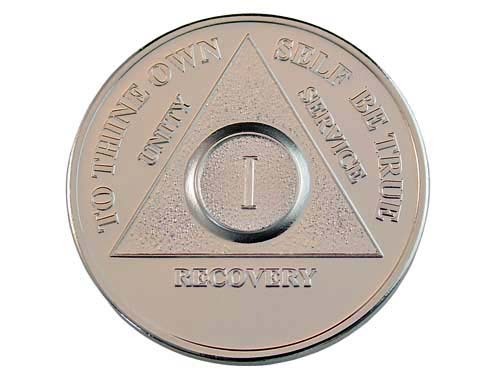 This gorgeous silver medallion is a distinctive commemorative gift for those reaching miracle milestones in their recovery. Available for 1 through 30, 35, 40, 45, 50, 55, and 60 year anniversaries. Each of these splendid 1/2 oz. 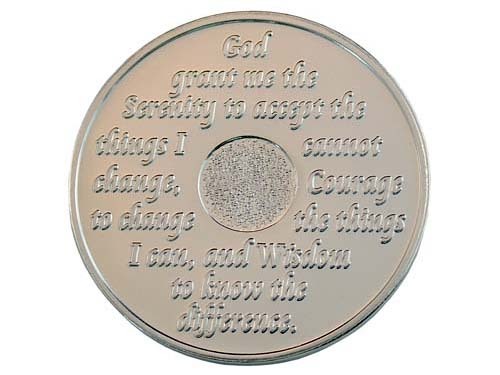 solid silver medallions has a subtle brushed finish and features the Serenity Prayer on the reverse side. They are a wonderful commemorative AA tokens for miraculous achievements! Please allow 10-15 business days for these special order medallions to be shipped. All .999 Silver Medallions are delivered in a nice velvet gift pouch at no additional cost. It's a great question! At this time, we are not offering this type of engraving to any of our metal medallions. Often, a local mall gift shop or engraving company (Hallmark or Things Remembered, etc.) can provide affordable options for additional customization and personalization of these medallions. Thanks for your interest! Please reach out if we can provide any additional information.